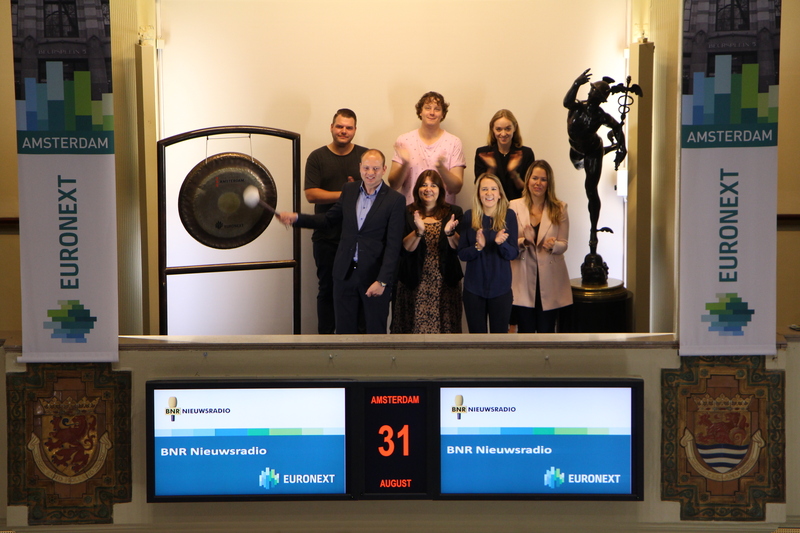 BNR Nieuwsradio celebrates the launch of its renewed podcast app by sounding the gong. With this innovative app it is possible to listen to live radio, but also to listen to On Demand podcasts with news and knowledge. The written news articles have also experienced an overhaul. The podcasts include innovation, business, and economics. Because of these easy-to-use audio clips, the listener won’t have to miss a thing. Sjors Fröhlich, editor-in-chief at BNR Nieuwsradio: "Radio will always last, the medium is far too beautiful. A podcast is perhaps the most intimate form of radio. That is why BNR is so fully committed to it." 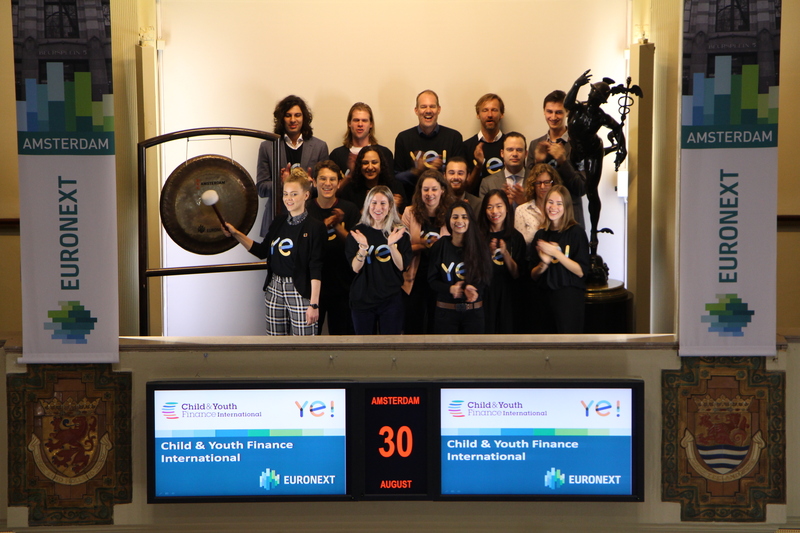 Child and Youth Finance International sounds gong with Ye! The Ye! Community, an international network of young entrepreneurs ages 16-30, sounds the gong on the occasion of their new Ye! Stream live feature. It allows community members to connect with other young entrepreneurs, connect with coaches, and connect with the information needed to grow their businesses. A newsfeed where entrepreneurs can discuss, ask for advice, source information, and collaborate with other entrepreneurs. The Ye! community is an initiative of Stichting Child and Youth Finance International (CYFI), and has been endorsed by the G-20’s Global Partnership for Financial Inclusion. They support young entrepreneurs around the world by connecting them to each other, to mentors, resources, tools and guides. There are currently 15000 members on the website representing 121 countries. CYFI is a global, multi-stakeholder network promoting economic citizenship for children and youth. CYFI leads the world’s largest movement dedicated to enhancing the financial and entrepreneurial capabilities of children and youth. Launched in April 2012, the Child and Youth Finance Movement has already spread to 125 countries with partners and collaborators having reached more than 36 million children and youth. 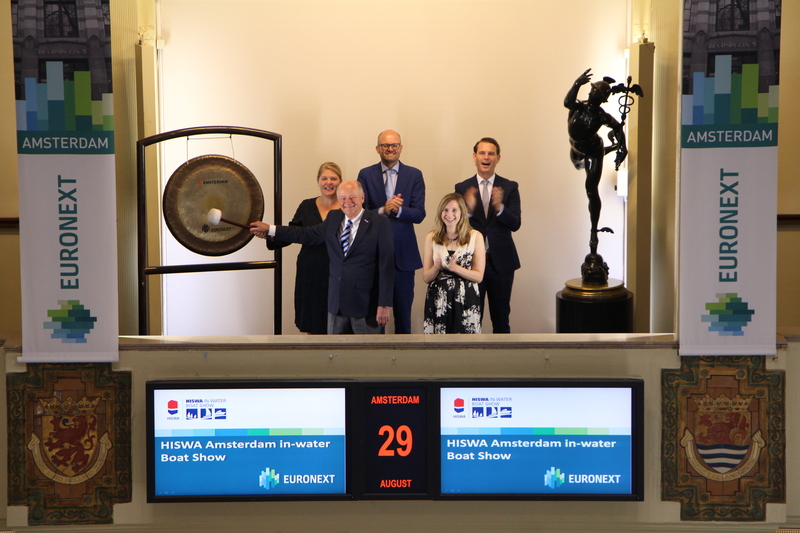 Paul Boomsma, CEO of HISWA in-water, and Michelle Jonker, open the trading day at Euronext by sounding the gong. They do this on the occasion of HISWA in-water Boat Show, which opens its doors for the 34th time this year. In the Amsterdam Marina there are about 250 boats from 29 August to 3 September. The HISWA in-water Boat Show offers a wide and diverse overview of small and large boats, series built or custom-built, made of aluminum, steel or polyester. For people who want to orient themselves to a possible purchase, the HISWA in-water is the preferred place, as virtually all major Dutch and European brands are represented at the boat show. The offer consists of daysailers, cabin sailboats, sailing yachts, catamarans, motor yachts, boats, tenders, sports boats and RIBs. On the quays are suppliers with water sports items. The Dutch Burns Foundation sounds the gong to draw attention to young children and their increased risk of burn injury, especially during the summer months. Ambassador Kick (9), burned by an accident with hot tea, sounds the gong. Young children are overrepresented in the burn centers in Groningen, Beverwijk and Rotterdam. Over a quarter of burn patients (25.8% in 2016) admitted in the three Dutch burn centers are under 5 years of age. Especially during the holiday season, there is an increased risk of burn injury, because the circumstances during a holiday are different compared to the circumstances at home and the daily routine is missing. For example: the campsite tabletop with the hot cup of tea is a little lower and less stable than the dining table at home. A child only needs a split second to reach for the hot tea cup. The consequences of burn injury for young children are severe. They have a much thinner skin and the burned body surface area is relatively large compared to a similar burn in adults. Children often need reconstructive surgery for many years. The three burn centers and the Dutch Burns Foundation (both part of Brandwondenzorg Nederland) want to prevent these accidents and therefore call on parents of young children to be alert. On 25 August 1992 Houthaven Plan B.V. was founded which was renamed Nieuwe Steen Investments in 1993 and listed in 1998. The honour of sounding the gong goes to Erna Smit, who has been with NSI from the very beginning. In February, management announced a new strategy in which it will focus purely on investments in offices. Year to date, with over €355 million of deals and the sale of 60% of its retail portfolio, NSI is one of the most active real estate companies in The Netherlands. NSI (ticker symbol: NSI) is a specialist commercial property investor and the only listed real estate investment trust (REIT) focused on The Netherlands. The NSI team aims to maximise returns for its shareholders through pro-active management of its investment portfolio and disciplined asset rotation. The portfolio was valued at €1.1 billion at the end of June 2017. Nlgroeit, a community for entrepreneurs with a company turnover between 1 and 100 million, recently made the 250th match between an entrepreneur and an experienced mentor. 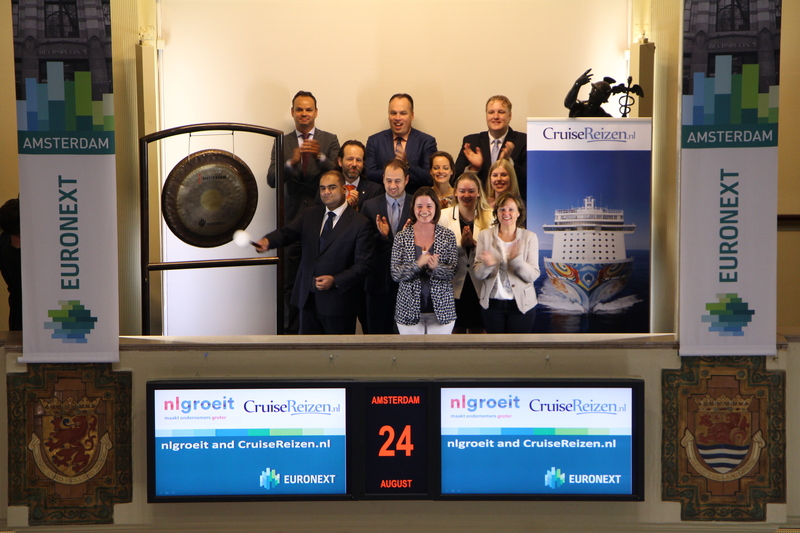 On this occasion, nlgroeit and cruisereizen.nl together sound the gong at the Amsterdam Exchange. Faizal Siddiqui, CEO of Cruisereizen.nl, joins the mentor program of nlgroeit: a joint effort between the Ministery of Economic Affairs, NLevator and the Chamber of Commerce. The initiative aims to increase the growth capacity of small and medium-sized enterprises in the Netherlands. Nlgroeit develops and supports initiatives where entrepreneurs can help each other in their peer-to-peer coaching process. The program brings entrepreneurs in contact with other entrepreneurs, mentors, coaches and trainers, who can help them to set their next growth leap. Nlgroeit wants to strengthen the strengths of existing initiatives: working together on a strong ecosystem for ambitious and growing entrepreneurs in the Netherlands. From 14 August to 23 August, the gong ceremony at Beursplein 5 focuses on the activity and entrepreneurship in the various regions in the Netherlands. 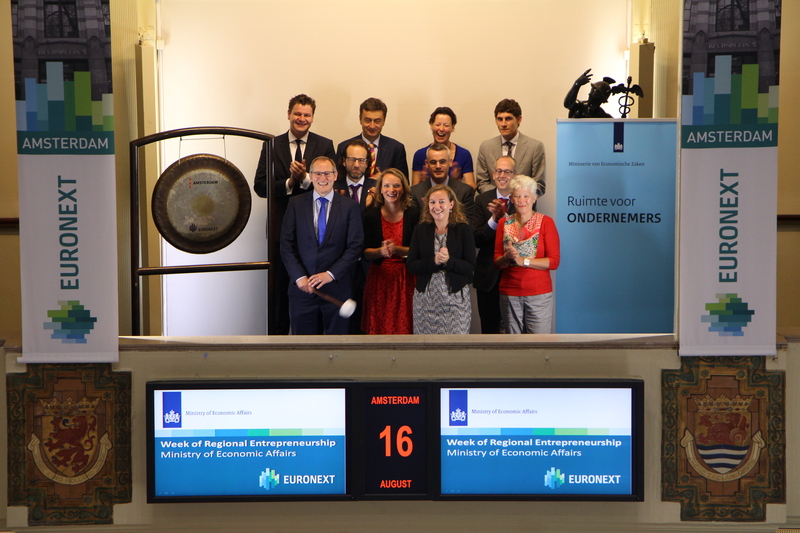 Euronext has invited the Ministry of Economic Affairs and the Regional Development Companies to put their work in the spotlight during the Week of Regional Entrepreneurship. SME Amsterdam opens the trading day. SME Amsterdam is an association that works for the benefit of local entrepreneurs in and around Amsterdam. They have a lot of contact with municipalities, provinces and other interested parties. In addition, they help local business collectors with lobbying. They focus on topics such as reducing local government pressure and local charges, fair procurement opportunities, accessibility of the region, safe and sustainable business climate and well-trained staff. Bart Drenth, chairman of SME Amsterdam: "Amsterdam has a beautiful historic city center with a great national and international appeal. But Amsterdam is (much) more than the inner city alone. The city of Amsterdam has other areas that are of major importance in the coming decades. It is also becoming increasingly clear that places around Amsterdam belong to the urban fabric of the metropolis. The city of Amsterdam is not an island in the region and the province, but it is a part of it. We advocate an integral spatial-economic view of the entire metropolis. Our partners are regional entrepreneurs who would like to contribute to this. We are pleased to open the exchange together with them." 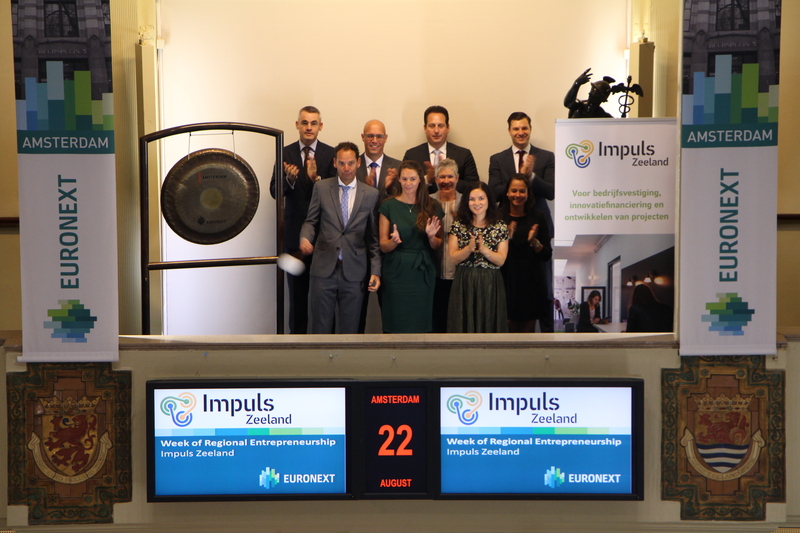 Economic Impulse Zeeland (Impuls), the regional development company of Zeeland, sounds the gong at Beursplein 5 and underlines the importance of regional development companies for the Dutch economy. Impuls also celebrates its ten-year anniversary. The development company was founded 2 July 2007 with the aim of increasing the dynamics of the economy in Zeeland. The organization does this by connecting people, both inside and outside Zeeland, in an innovative and surprising way, leading to new economic impulses. They further develop Zeeland into an innovative and healthy province. For example, Invest in Zeeland, the promotion and acquisition branch of Impuls, has guided over 100 companies in the past ten years at their location or expansion in Zeeland, this created 2379 jobs. René van Vlerken, Head Small & Mid Cap Listings at Euronext Amsterdam: ''The Regional development companies are extremely important for the growth of the Dutch economy and accelerating innovation.'' Entrepreneurship and the exchange go hand in hand, for over 400 years. Euronext plays an important role in the financing of the real economy. 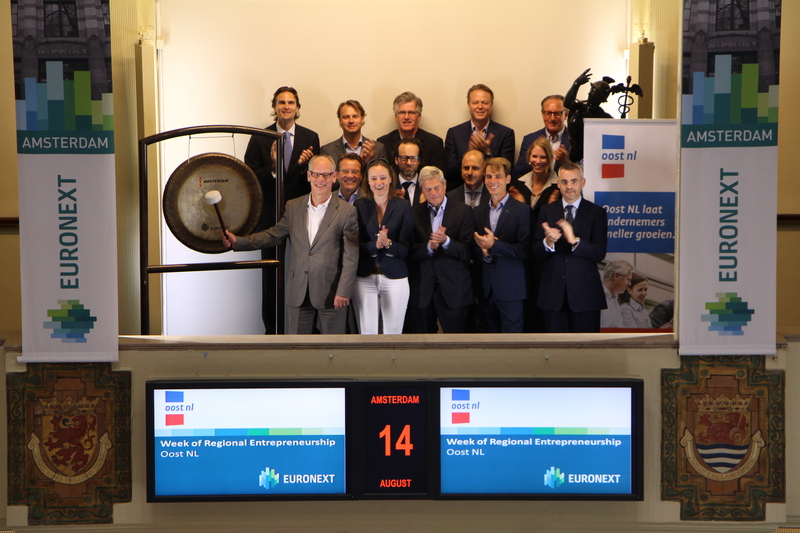 "With initiatives like Euronext Growth and our exclusive TechShare program, we support medium and small businesses in their growth, we provide access to finance, help in promoting the organization, and increase its visibility." Han Weber, regional minister for Energy in the Province of Zuid-Holland, opens the Amsterdam exchange today for entrepreneurs seeking investment capital for the marketing of their energy-innovations. 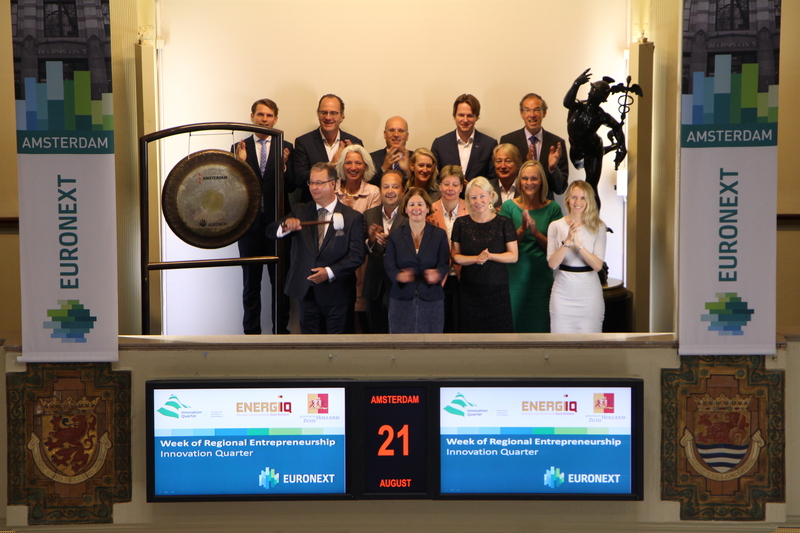 On 1 September, a new investment fund will be launched, specifically for these entrepreneurs: ENERGIIQ, the energy-innovation fund of the Province of Zuid-Holland. ENERGIIQ will be executed by InnovationQuarter. InnovationQuarter, the regional development agency for Zuid-Holland, is the fund manager of ENERGIIQ. With IQCapital and UNIIQ, InnovationQuarter in the past few years has built an extensive track record as investor in innovative and fast-growing companies. With ENERGIIQ InnovationQuarter hopes to finance even more sustainable entrepreneurs who can make a specific contribution to energy transition. From 14 August to 23 August, the gong ceremony at Beursplein 5 focuses on the activity and entrepreneurship in the various regions in the Netherlands. Euronext has invited the Ministry of Economic Affairs. Regional Development Companies, and regional entrepreneurs, to put their work in the spotlight during the Week of Regional Entrepreneurship. UvA, AMC and HvA Holding BV are fully owned subsidiaries of the University of Amsterdam, Academic Medical Center and the University of Applied Sciences of Amsterdam respectively. The three holdings manage companies set up to valorise and commercialize the intellectual property generated by the universities. “New ventures”, a subdivision within the holdings, primarily focuses on commercializing groundbreaking innovations from the three knowledge institutions, assisting scientists and entrepreneurs with company creation, investments, scaling up and exits. As of 2017, the three holdings collectively manage approximately 35 active portfolio companies. In addition to growing technology centric companies, the holdings also stimulate entrepreneurship amongst students and researchers by sponsoring many educational programs and events in Amsterdam. In this respect, the holdings actively contribute to and participate in initiatives that further develop the thriving entrepreneurial ecosystem in the Amsterdam region. 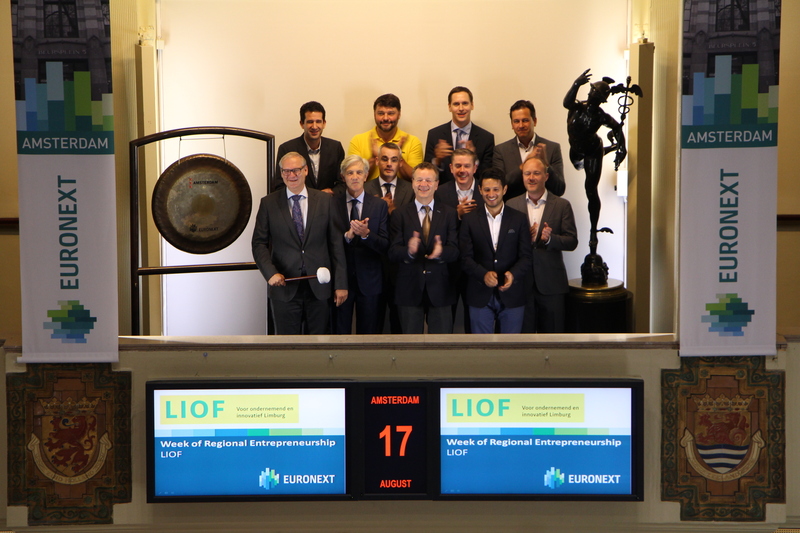 LIOF visits the Amsterdam exchange to open trading during the Week of Regional Entrepreneurship by sounding the gong. They attended the gong ceremony with Limburg-based companies: Ronmas, Robomotive, Vectioneer, Mine Kafon, Accerion, and GDO. LIOF helps SMEs in Limburg to grow and supports them every step of the way. By supporting SMEs we stimulate growth in the entire region. If the region grows, so does everyone in it. For LIOF growth is not just about sales and profits but also about greater competitiveness - to offer advantages and generate social returns. LIOF’s work in the region is made tangible by creating jobs in Limburg, providing relevant products and services in and for Limburg, and enhancing the reputation of the region as it ascends the rankings for innovation and job opportunities. From 14 August to 22 August, the gong ceremony at Beursplein 5 focuses on the activity and entrepreneurship in the various regions in the Netherlands. 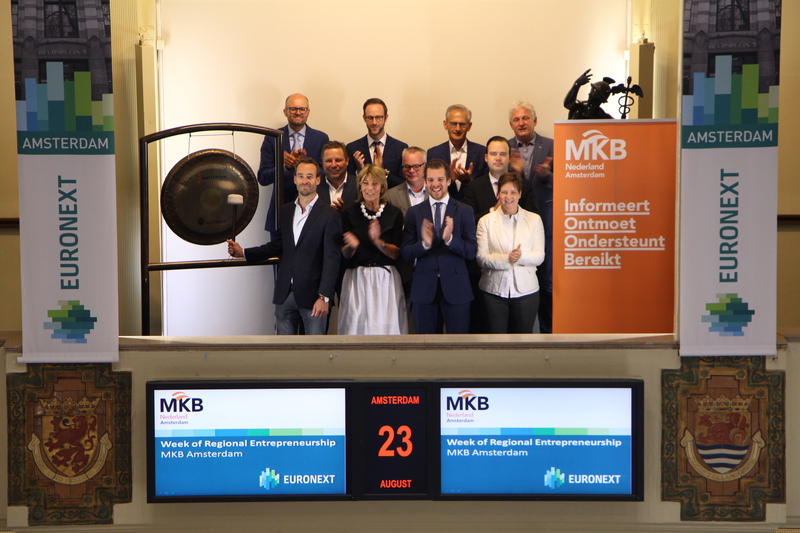 Euronext has invited the Ministry of Economic Affairs and the Regional Development Companies to put their work in the spotlight during the Week of Regional Entrepreneurship. The Ministry of Economic Affairs, along with regional governments (mostly provinces), is a shareholder of five RDCs (NOM, Oost NV, LIOF, BOM and IQ). The RDCs connect national innovation and top sector policy to regional economic policy, and in doing so are important for the services to innovative SMEs. Through their venture capital companies RDCs support and finance innovations of SMEs and contribute to the economic growth and employment of the region. Pieter Waasdorp, director of entrepreneurship, sounds the gong in the presence of colleagues, all of whom are concerned with the RDCs. Pieter Waasdorp: "The Ministry of Economic Affairs supports and encourages entrepreneurship in the Netherlands in different ways. For example, by improving access to finance for SMEs, by providing information and by issuing guarantees such as the BMKB and the GO to companies. In addition, we encourage the start-up and growth of companies and help companies to new forms of funding. We do this together with partners like the Regional Development Companies, but also with Startup Delta and the Chamber of Commerce. " 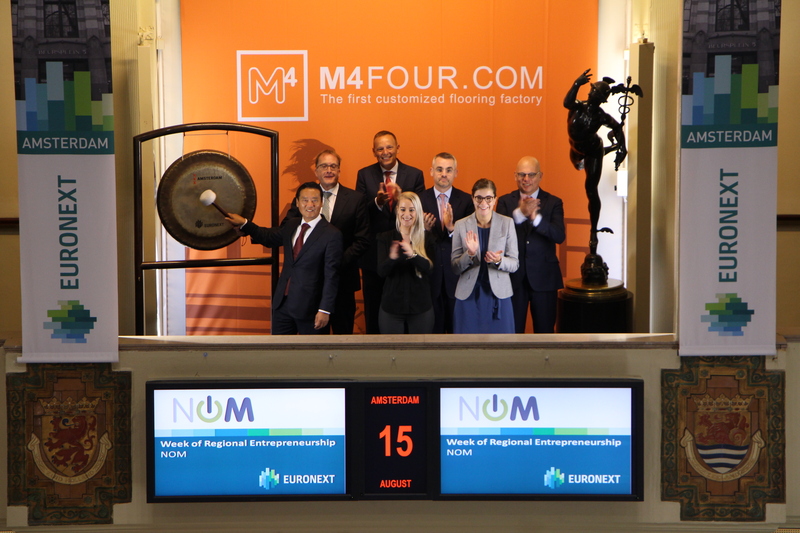 Development Agency East Netherlands (Oost NL) opens the trading day at the Amsterdam exchange of Euronext by sounding the gong to bring attention to the innovative business stars in which they have invested. Innovation is important for companies, as well as regional and national economic development, and Oost NL takes this opportunity to bring attention to the innovative companies it has boosted over the years. Some of these companies have been invited to attend the ceremony: Xenikos, MIMETAS, Hygear, Solease, Axign, and NIZO. Many innovative start-up companies fail to make the leap from their product development phase to a growing enterprise that registers consistent performance and growth. In order to help bridge this transition, at Development Agency East Netherlands they leverage investments made using funding from the Dutch government, as well as the provinces of Gelderland and Overijssel to help business owners to grow faster through innovation, investing and internationalization. Together with the business owners, Oost NL searches for the right type of funding for each situation. The goal is to help businesses to responsibly transition from start-up to growth phases and eventually to stimulate the local economy through new jobs. This is how they strengthen the regional economies. They do this at the behest of the Dutch Ministry of Economic Affairs and the provinces of Gelderland and Overijssel. Saxophonist Stefan de Wijs of the Keuris Quartet opens the Amsterdam exchange on the occasion of the Grachtenfestival. The Keuris Quartet will perform ‘Nieuwe noten voor Keuris Quartet’ during the Grachtenfestival at the StadSalon. Three new works have been composed for the occasion. The composers will attend the concert to listen to the world premiere of their own compositions. This year the Grachtenfestival will present very talented young musicians on wonderful venues. Performing musicians will leave trodden paths and unlock new worlds for the audience. Thrilling sound on ruddy locations, intimate concerts on historical premises. Each performance is outstanding and a pride to the Grachtenfestival. 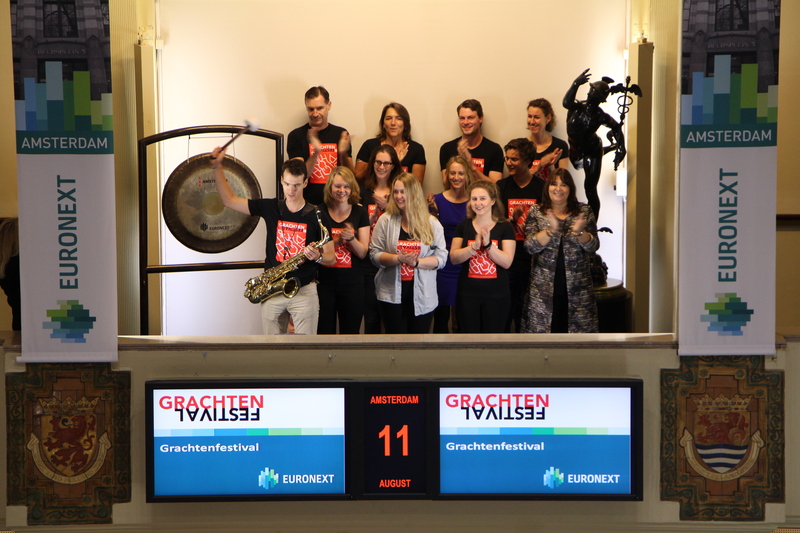 The Grachtenfestival is celebrating its 20th birthday and does so ‘In Style’, which is the festival theme this year. From 11 – 20 August the capital city is fizzing with classical music, jazz and world music, performed by a topnotch variety of international and young musicians. The entire program consists of over 250 concerts on more than 90 venues. Fund and asset manager ACTIAM published the results of the annual responsible investment survey conducted by Principles for Responsible Investment (PRI). ACTIAM received the highest score in 11 out of 14 modules. Compared to 2016, ACTIAM improved its score in seven modules. 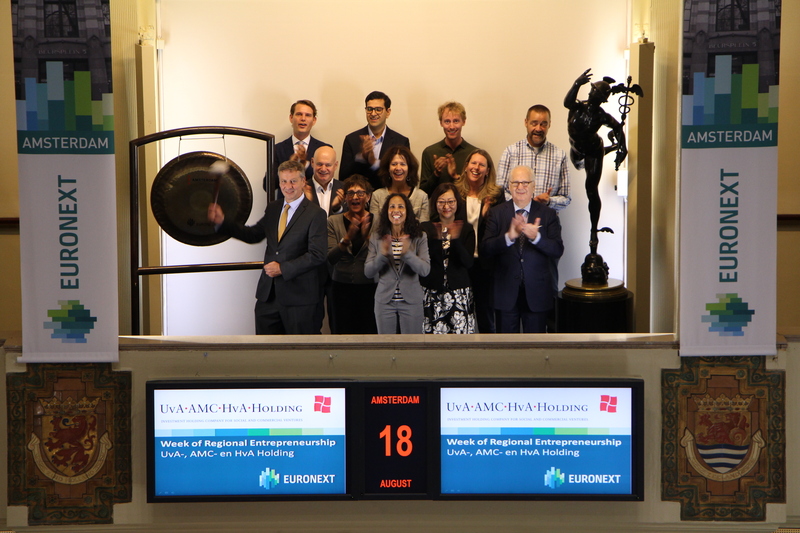 On this occasion they sound the gong at the Amsterdam exchange. PRI conducts an annual responsible investment survey among its members. Respondents receive a score ranging from E to A+ for each module. ACTIAM obtained the highest possible score for its active ownership approach. In the area of inclusive finance (e.g. microfinance and SME financing in emerging markets) ACTIAM managed to improve its score from A to A+. This means that ACTIAM is in the top 10% of the market. 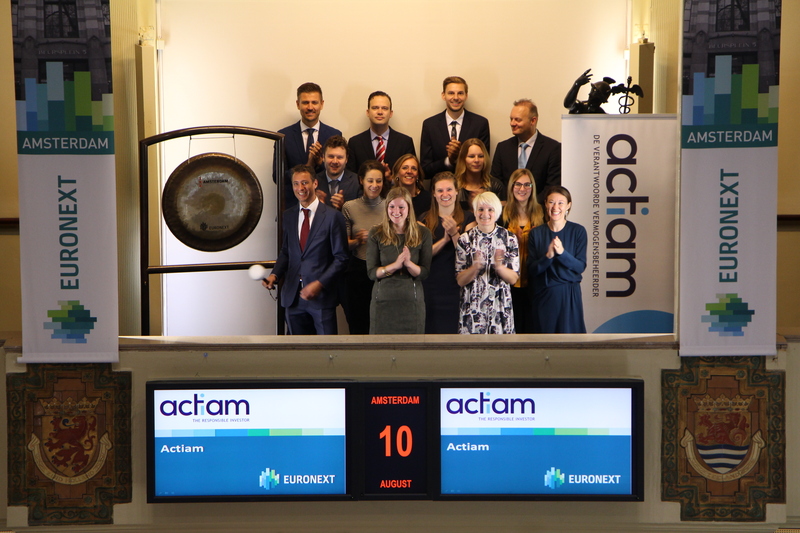 ACTIAM is a leading responsible asset and fund manager for more than one million people in the Netherlands, with €54.6 billion in assets under management (as at December 2016). ACTIAM offers a comprehensive range of investment funds and investment solutions that extends from index investing all the way to impact investing. They impose strict criteria on their investments and follow a strict, scrupulous selection process without making concessions in the area of financial returns. 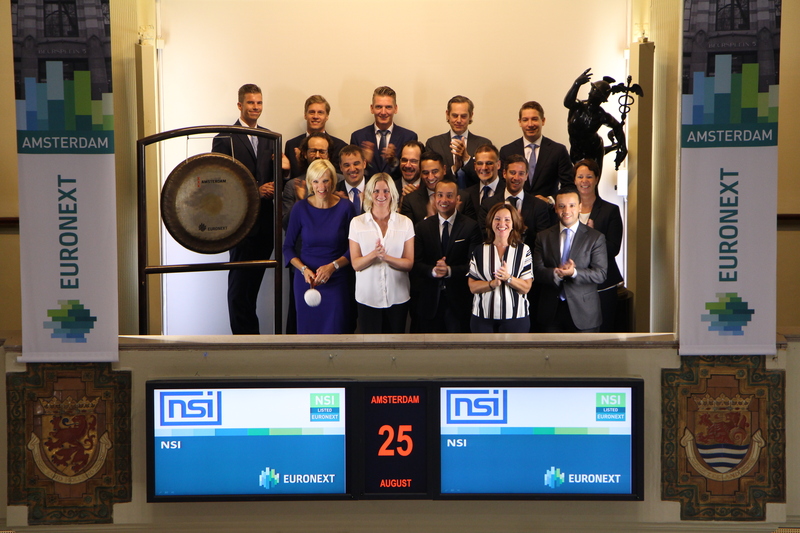 Euronext is very proud to welcome Jensen-Group for a bell ceremony in honour of their 20th listing anniversary because this family business has a remarkable track record on the Brussels Stock Exchange. Financial service provider Ebury has seen such a rapid growth in the Benelux that they are opening a new office at the Zuidas in Amsterdam. 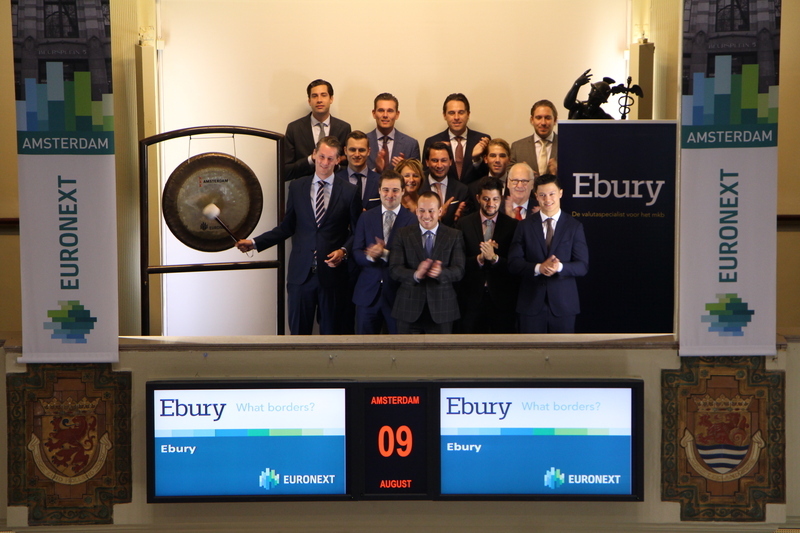 On that occasion, Ebury opens the trading day at the Amsterdam exchange. The company started with five employees in Amsterdam, four years ago. Currently the company has seventy employees and Ebury helps over five thousand relations with international payments and risk management. With this growth in mind, a new office was opened in the capital city, at the Zuidas. Ebury is a specialist in currency transactions and trade finance. The financial service provider offers access to more than 150 currencies, market expertise, and the company provides working capital to support fast growing companies. 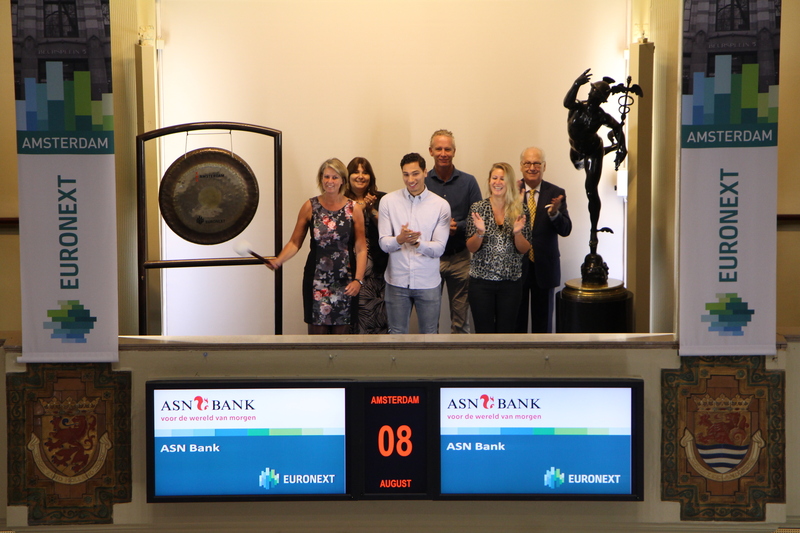 ASN Bank visits the Amsterdam exchange of Euronext and opens trading by sounding the gong. They do so on the occasion of them recently obtaining – once again – five stars for the terms of their ASN Bank savings account. ASN Ideaalsparen scored the maximum score in the June 2017 MoneyView survey for the second time in a row. ASN Depositosparen received the highest rating for the fifth year in a row. According to MoneyView, ASN Bank’s savings accounts offer more opportunities than comparable accounts from other banks. Former professional-cyclist Maarten Tjallingii opens the trading day at the Amsterdam Exchange for BinckBank (ticker symbol: BINCK) to celebrate the start of the first BinckBank Tour, the biggest professional cycling event in Belgium and The Netherlands with stars like Giro d’Italia-winner Tom Dumoulin and World Champion Peter Sagan participating. BinckBank will be the name-sponsor of the race for the next five years. The bank wants to increase its brand awareness. Also investors are known to be fans of cycling and followers of cycling events. BinckBank is the biggest independent Dutch online bank for small investors and offers a range of financial products to retail customers in five European countries. 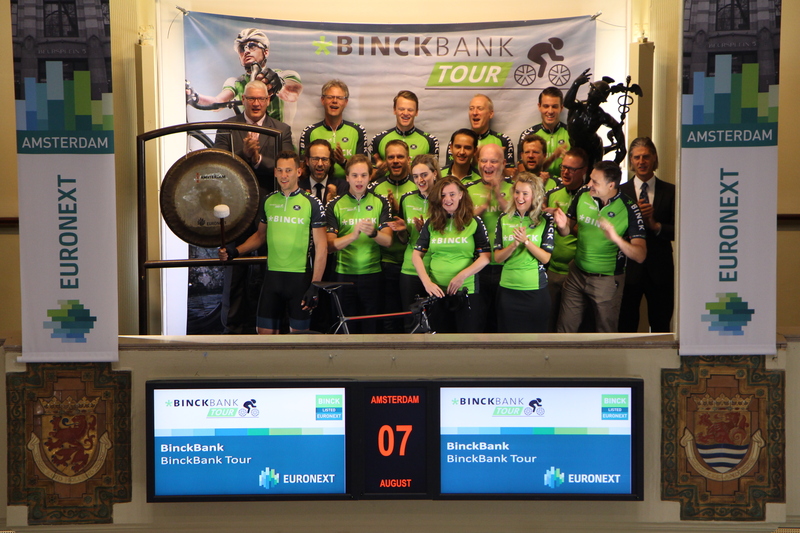 BinckBank is listed on Euronext Amsterdam since 2005. 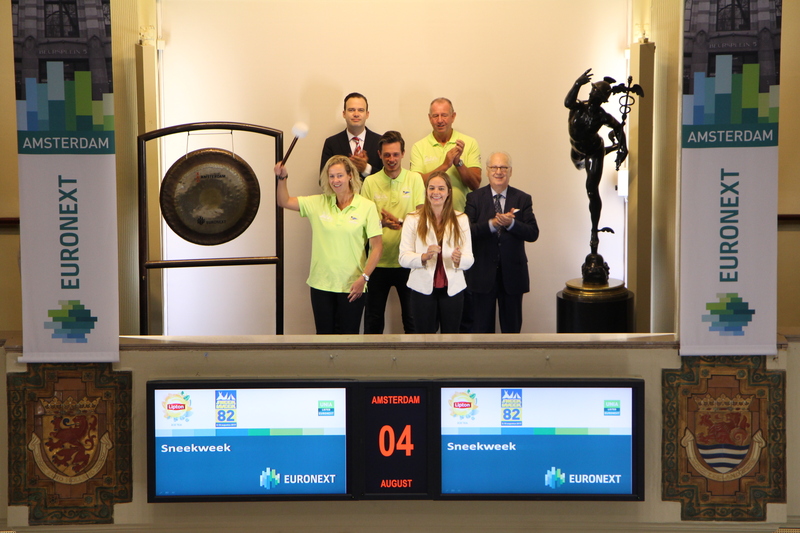 The sounding of the gong at the Amsterdam exchange launches the Sneekweek. The biggest sailing event on inland waterways of Europe is held for the 82nd time from 5 to 10 August. More than 1,800 participants in 35 different sailing classes compete for a spot on the highest podium. The organization of the event is in the hands of the Royal Watersport Sneek. The sailing competitions take place every day at the Sneekermeer, where more than 150 volunteers from the Royal Watersportvereniging will be working all week. From early morning until late at night, they ensure that the regatta runs smoothly. The KWS is thereby financially supported by a number of large nationally operating companies. 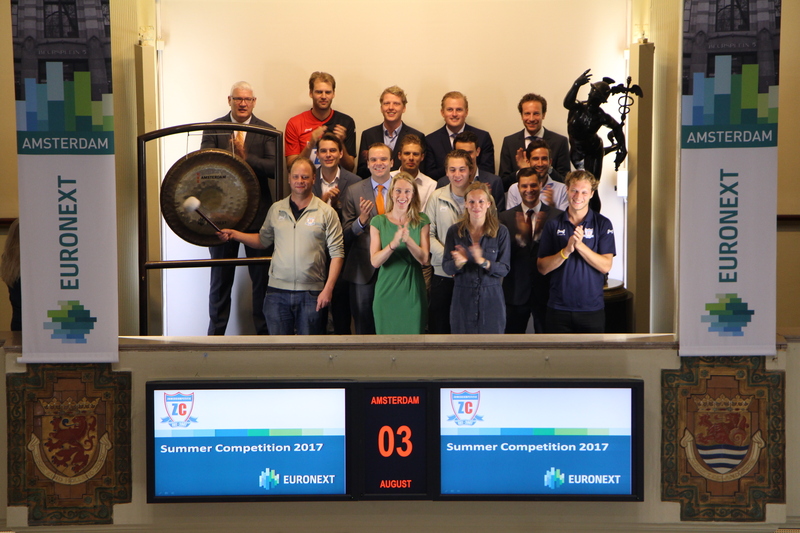 The event is sponsored bij Lipton Ice Tea, part of Euronext listed Unilever (ticker symbol: UNIA). Between 30 May and 11 August 25 over 100 companies participate in the tournament. Teams compete during the course of 20 playing days, in the hopes of achieving the 2014 football and hockey title. The league has a unique character; both football and hockey takes place at one location, and is played in a format of six against six. In addition to the sport aspect, the Summer Competition provides a networking platform where both participating companies and sponsors can meet young professionals. Ten percent of the profit will go to charity, the Hockey Dreams Foundation. Tellow celebrates the launch of her bookkeeping solution for freelancers. Tellow was recently introduced, after a year of rigorous user testing and developing. The overwhelming number of applications confirmed the need for a good solution. To no surprise because bookkeeping is in fact not the most popular part of doing business, it takes time, money and often causes stress. Tellow is bookkeeping on the go. Freelancers get real-time insight into their financials through a direct link with the current account. Tellow automates manual processes, such as scanning and booking of receipts. By offering a cloud solution for web and mobile, Tellow meets the fundamental needs of this user group. 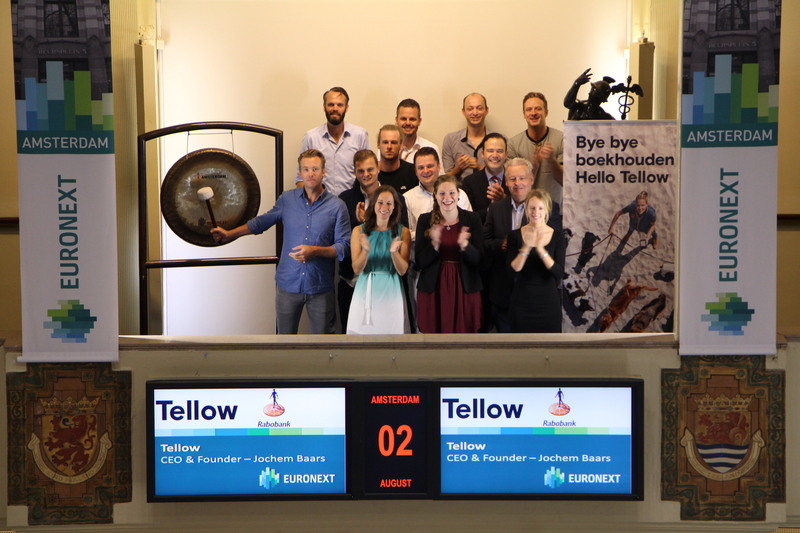 Tellow is a Moonshot from Rabobank's innovation program. With so-called Moonshots, employees get the opportunity to develop innovative ideas and prepare them for market launch. Tellow is now available throughout the Netherlands. LYNX is known for its brokerage services for retail investors. Several months ago, LYNX introduced an investment fund; The LYNX Rendement Fonds. 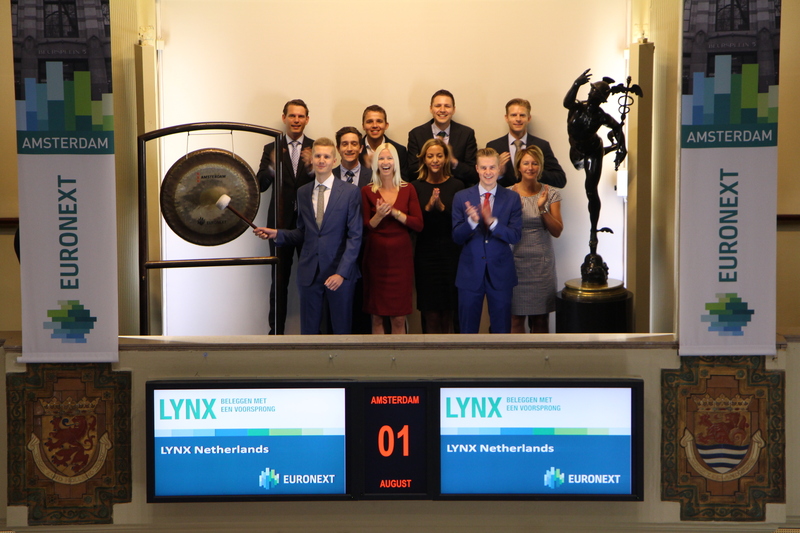 To officially celebrate the launch of this new product, Tycho Schaaf, Portfolio Manager of the LYNX Rendement Fonds, will open the trading day at the Amsterdam exchange. What makes the LYNX Rendement Fonds unique? The LYNX Rendement Fonds aims to achieve an annual positive return, regardless of whether the market goes up or down. The fund has a large number of automated trading systems at its disposal. In times of falling stock markets and relatively high volatility, the fund is able to sustain its positive performance.The investment fund of LYNX serves as a good supplement for any investment portfolio.